Barcelona have tied Ernesto Valverde to a new deal for 2019-20, with his contract containing the option for a 12-month extension beyond next summer. A coach who guided the Blaugrana to a Liga and Copa del Rey double in his debut campaign had been due to see his current terms expire at the end of the season. Questions had been asked of his future amid the uncertainty surrounding his ongoing presence at Camp Nou. Leading figures at Barca have, however, spoken out on a regular basis regarding the club’s desire to retain the services of a proven winner. 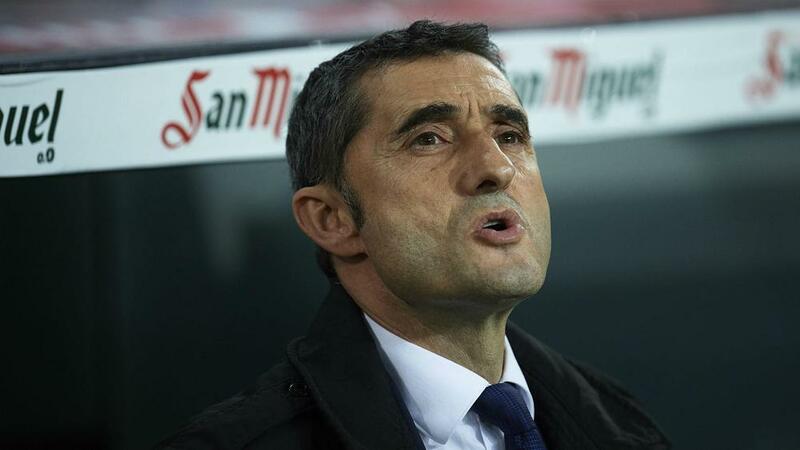 An agreement has now been reached to keep Valverde in his current post for at least one more season. In a statement released on the club’s official website, Barca said of their boss: “Since his arrival as coach, Valverde has recorded some spectacular numbers only achieved by a select few. In his first season he won both the league title and the Copa del Rey and in 2018-19 he has already added the Spanish Super Cup to that list. “In total the coach has led FC Barcelona in 96 official matches, winning 65, drawing 22 and just nine defeats. Of those 65 victories, 43 have come in the league, 11 in the Copa del Rey, 10 in the Champions League and one in the Spanish Super Cup. “The Barca coach came within a whisker of leading the side to an undefeated 2017-18 La Liga season. Only a defeat late on in the campaign at Levante prevented the team from making history. The team also scored in 37 consecutive matches in the league, the run only coming to an end last Sunday against Athletic Club. “In his 96 games as Barca coach Valverde has seen his team score 233 goals whilst only conceding 78 (45 clean sheets). “Leo Messi is top scorer in the Valverde era with 74 goals, followed by Luis Suarez on 47, Coutinho (18), Dembele (17), Paulinho and Pique (9) and Rakitic (8). With regards to assists, Leo Messi leads the way again with 32 then come Suarez (25), Jordi Alba (23), Sergi Roberto (13), Dembele (12) and Coutinho and Rakitic (11). Those star names will be hoping to continue figuring prominently under Valverde in the weeks and months to come. Barca are currently back at the top of the Liga table, but have seen their lead cut by arch-rivals Real Madrid to six points. The Blaugrana are also into the semi-finals of the Copa del Rey, where they are taking in a two-legged Clasico clash with Real, and are set to face Lyon in the last 16 of the Champions League.